Editor’s Note: The YearlyKos convention in Chicago this past weekend was a major milestone in the history of the liberal blogosphere. The event confirmed the ascendancy of bloggers as a serious political force — all seven of the Democratic Party candidates attended in an attempt to woo progressive voters. As part of our ongoing effort to bring Medialoper readers the latest news about the increasing influence new media is having on the American political process, we sent the head of our National Affairs Desk, Ronin Kurosawa, to report on the event. Due to certain budgetary constraints we were not able to send Ronin to Chicago. 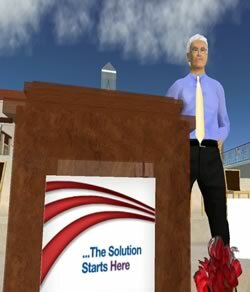 Instead, he reports from Second Life. I’ve been to more conferences than I can remember and this is the first time I’ve ever arrived at one without either jet lag or a hangover. The problem with virtual conferences is that the open bars just don’t compare to real life. The technology is improving rapidly, but I suspect this problem will persist for decades to come. 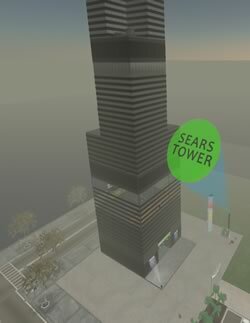 I’m hovering two floors above ground level just outside of the Sears Tower. I’m not nearly caffeinated enough to attempt entering the faux building to ride the faux elevator up to the faux conference room. No, it really is easier to float in space and watch the Network Neutrality panel through the window. I’ve missed the introductions, but I can hear the panelists discussing all of the major issues related to network neutrality, and beyond. Universal broadband – check. Personal data privacy – check. They’re discussing important issues that will shape the future of the net, and, by extension, the future of our country. As political scandals go, this was an odd one. Gaming blogs were buzzing last week with reports of a bizarre incident involving the staff member of a U.S. 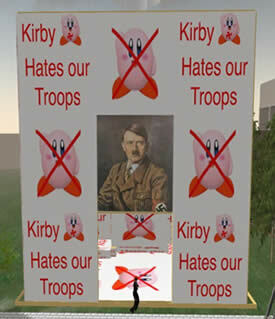 Senator who (allegedly in a drunken rage) used a plot of land in Second Life to build an offensive display of protest against a fluffy pink video game character known as Kirby. Early accounts of the incident raised more questions than they answered. 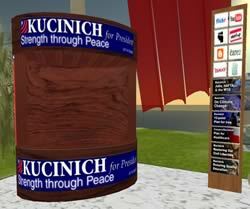 An SLNN story failed to reveal the identity of the Senator, offered only the slightest of reasons why someone would hate Kirby enough to portray him as a sig heiling Nazi who “hates our troops”, and raised the possibility that our national security might be at stake as a result of the Senate staffer leaving passwords posted on his computer monitor. When mainstream political pundits grouse about the risks of swimming too far into the deep end of the new media pool, I’m pretty sure this is exactly the scenario they have in mind. After re-reading the SLNN story a half dozen times, the mystery surrounding the identity of the Senator and his staffer became too much for me to bear. I’m sorry to report that I’ve spent most of the past week tracking down the participants in this absurd tale, and untangling a web of accusations, lies, and deceptions. Now the whole story can be told.